"Trust Fords, your local Dimplex Accredited Installers"
Dimplex offers a range of affordable and attractively designed electric heating solutions that are efficient, reliable and durable. Dimplex is the market leader in electric heating and is suitable for any house. Dimplex heaters can be used to heat a single room or an entire home making them a flexible heating choice. At Fords of Sidmouth, we are Dimplex accredited installers and a Quantum Installer Partner. Our range of Dimplex electric heaters are available to view at our electrical showroom in Sidmouth, Devon. Here you can see the range of options available and we can help you choose the right heater for your home. Call today for a free quotation or visit our showroom. The Dimplex Quantum Heater is the world's most advanced electric space heater. 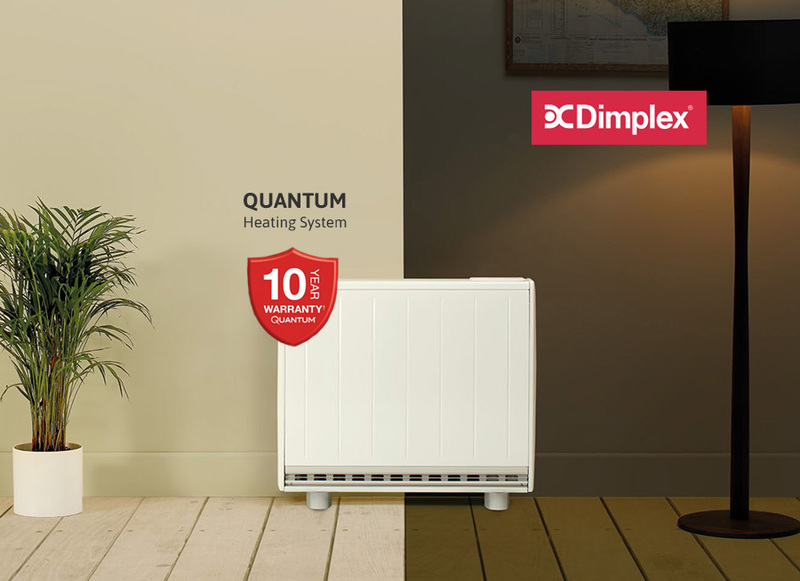 The Quantum stores heat up during off-peak periods when the electricity tariff is low, making it the most economical electrical heating system on the market. Each Quantum heater is fitted with an iQ controller. This adjusts the amount of heat released to maintain your required room temperature to within 30 degrees centigrade. Through a sophisticated self-learning algorithm the iQ controller is able to learn your heating habits and deliver the right amount of heat to match your lifestyle. It even monitors the weather and responds to changing climate conditions automatically! The heat levels can also be adjusted manually using the heater's electronic interface. Cost Efficiency: Quantum is up to 27% cheaper to run than a standard storage heater system. It's also up to 47% cheaper to run than an electric convector or radiator system(calculated using SAP 2012 - the only Government approved energy performance assessment method). Quantum is a viable alternative to a traditional central heating system and a particularly attractive option for homes off the main grid supply. Peace of Mind: Each Quantum heater installed by Fords is guaranteed for 10 years. Quantum is also BEAB approved. Controllable Heat: The iQ controller allows you to pre-set your heating requirements, just like a central heating system. You can manually adjust this at any time and the iQ controller will release just the right amount of heat to match your lifestyle and heating requirements.